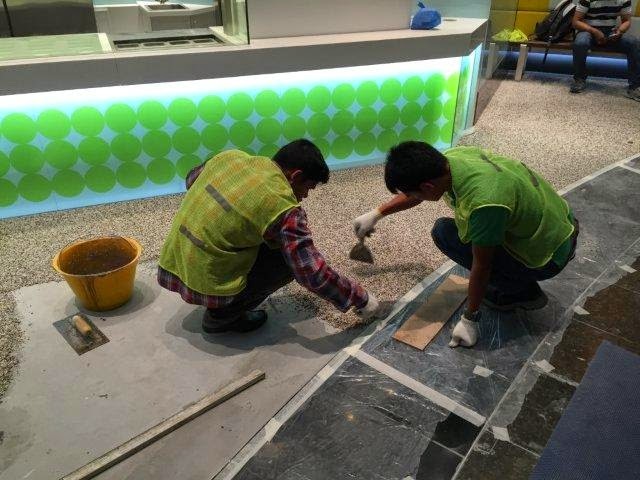 Contractor uses 10 Minute Concrete Mender to make pebble-crete floor. 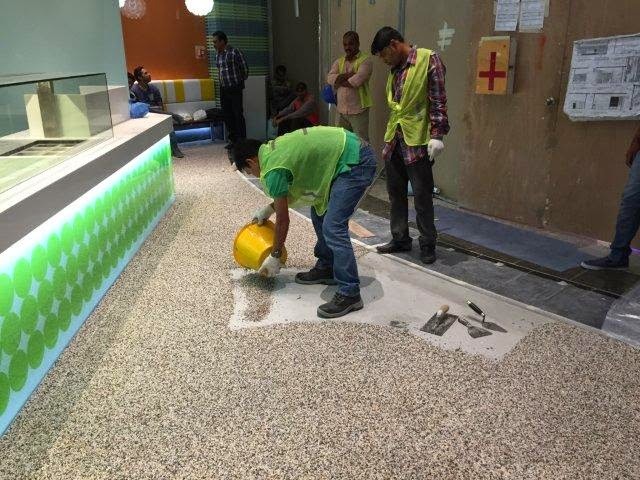 Basic SYSTEM in Bahrain is using Roadware 10 Minute Concrete Mender™ to make rapid curing pebble-crete flooring in Bahrain. The easy mixing Concrete Mender combines with the pebbles and acts as a binder in seconds. The mixture is easy to apply and trowel flat without getting sticky until the final minutes of curing. See the video here. 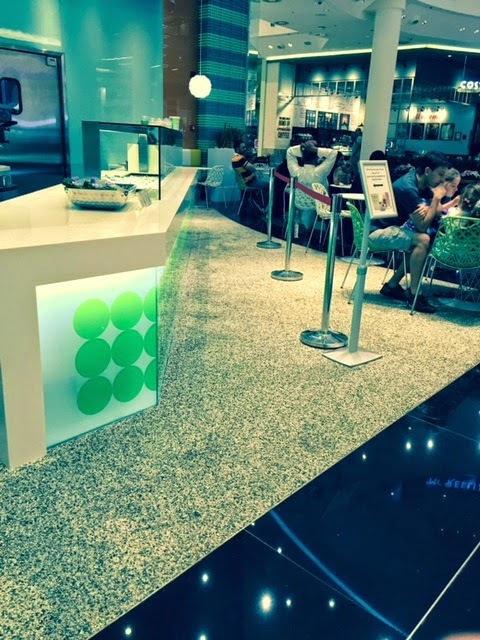 Pebble floor application at a Pinkberry Store in Bahrain. The pebbles are completely coated and help in place by the Roadware 10 Minute Concrete Mender™. The floor performs well and creates the look specified by the designer. The floor does not need further sealing. Daily maintenance consists of vacuuming and mopping. Hello George at Basic SYSTEMS in Bahrain. Your application has not been tried before with Concrete Mender. How does the surface look? It’s giving a wet look / looking really nice.. they have used resin in the past in other outlets, but the problem it was not strong enough and was smelling due to cleaning process. Are the rocks coated completely? Do any of the rocks come loose? Will the floor be easy to clean? Do you use a clear sealer after the application? 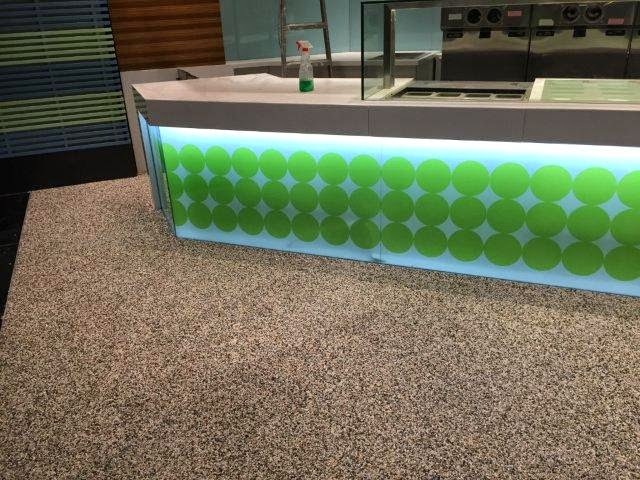 The pebbles are completely coated/ by sealing it, will loose the natural look as required in the concept design.